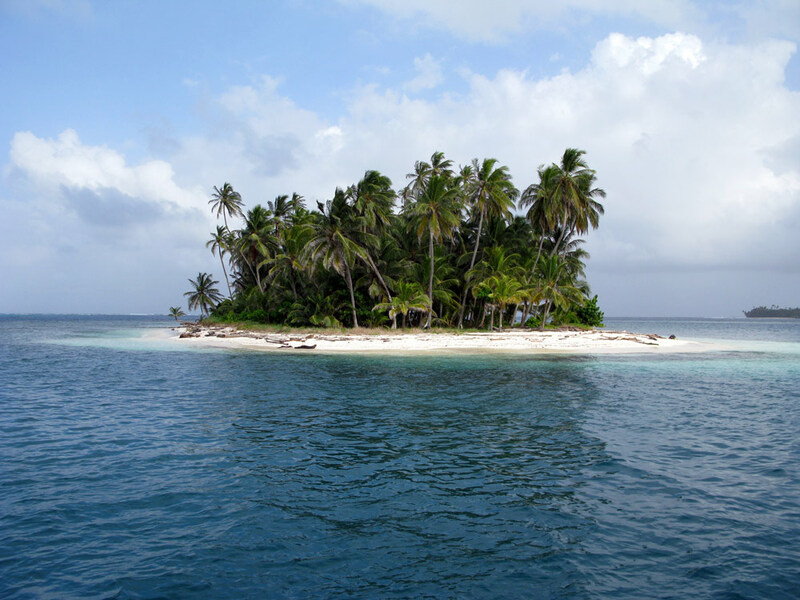 The San Blas Islands, a private paradise. 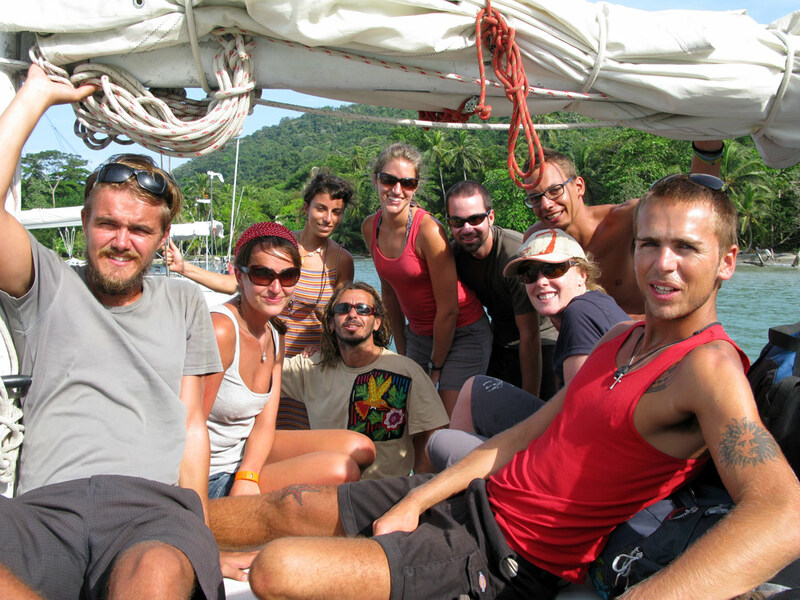 We woke before dawn in steamy Panama City on December 10th to begin our journey to South America. Caroline and I squeezed ourselves and all of our belongings into the back of a Land Cruiser for what would start the longest, most expensive way you could possibly travel from Panama to Colombia. The pavement turned to gravel then turned to dirt in about an hour and then we came to a deep river cutting across the ‘road.’ There were a few other trucks stopped there at the bank, and I honestly thought this would be a major delay. But seconds later the driver dropped it into low gear and plunged us and his brand spanking new ‘Crusier into the water. Waves washed over the bumpers, steam hissed and shot up as the cold water washed over the hot brakes. We headed downstream to avoid sucking water up the intake. This guy knew what he was doing, no delay at all. We spun our wheels up the muddy bank and continued down to the coast. Pacific Ocean to Caribbean Sea in under three hours! 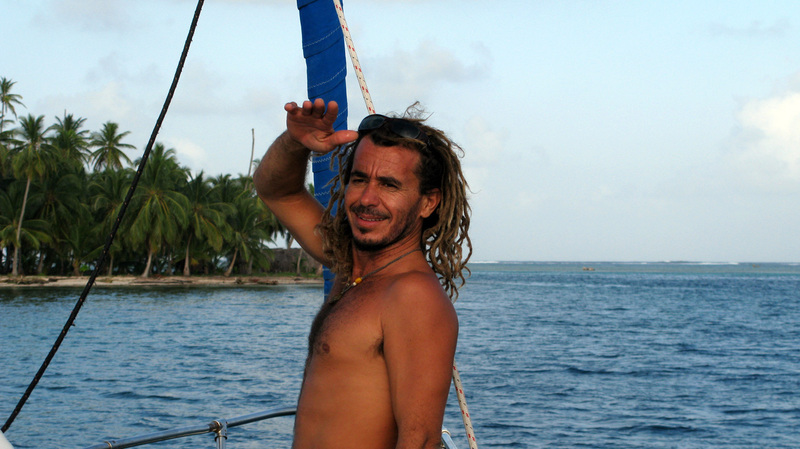 Soon we were on a long-boat with the other continent-crossing gringos we would get to know very well on board the Winfli. 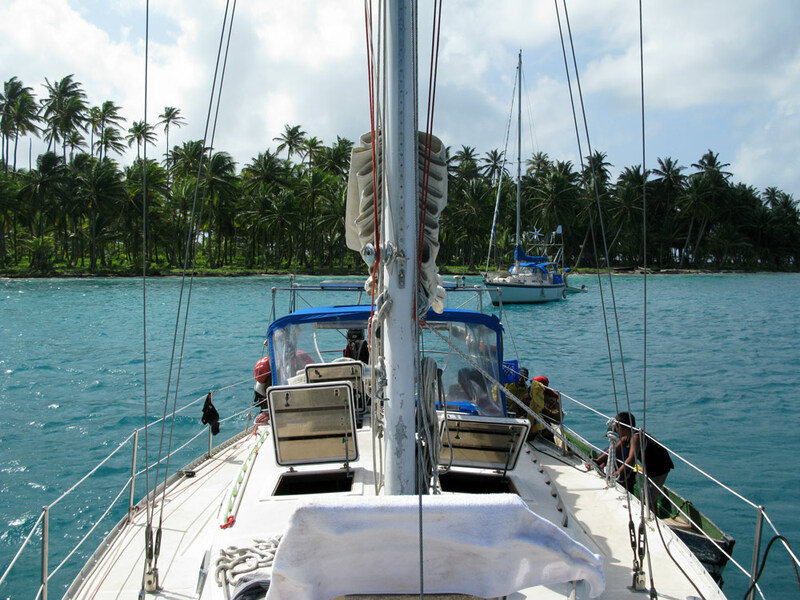 We arrived as Captain Bruno was pulling her into harbor behind one of the more inhabited of the San Blas Islands. Introductions were quick and we got a very brief tour of the vessel. 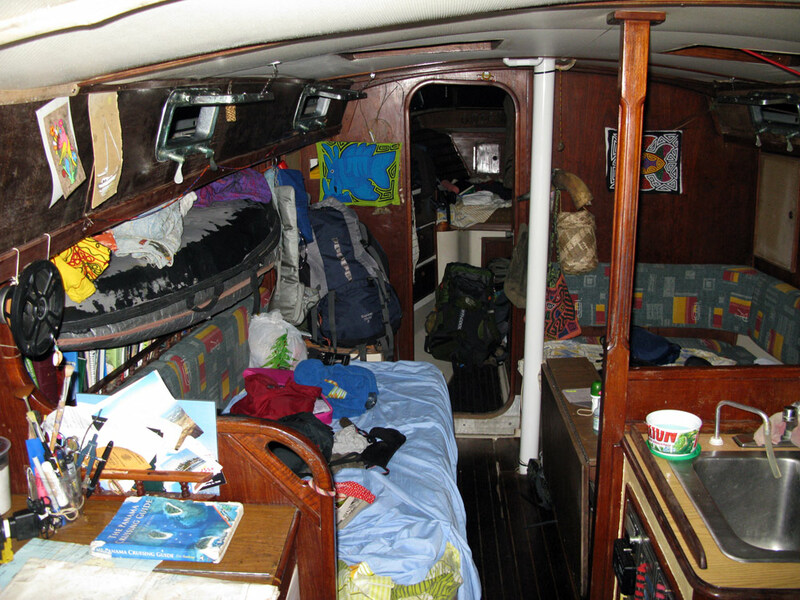 Winfli is a 39 foot sailboat, there were now 10 people on board, space was tight. 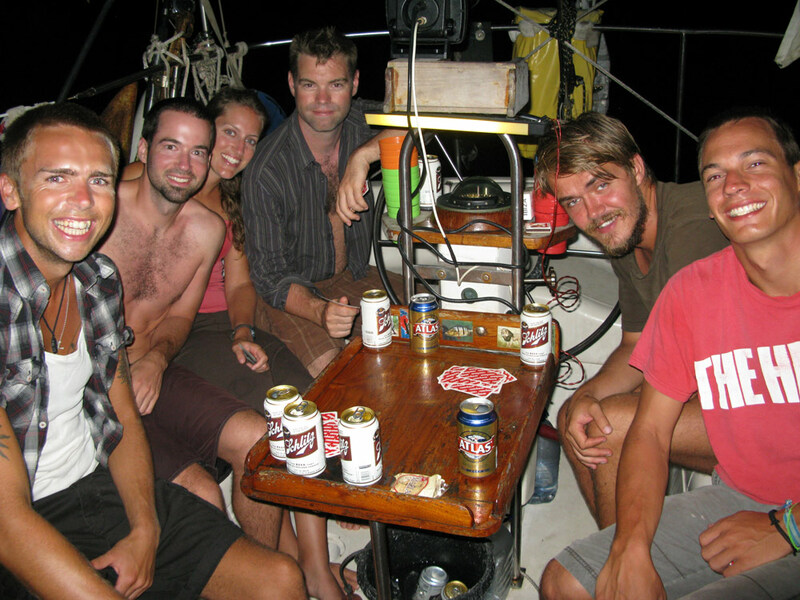 On board with us was Kirsty and Jim (UK), Craig and Caren (NZ), Marcos and Stefan (Austria). We all shared one head (toilet) with a sea-water hand pump to flush it. One sink in the kitchen with a sea water foot pedal and a fresh water tap when absolutely necessary (or when Bruno wasn’t looking) for rinsing the salt off hands, faces, teeth and silverware only. Electricity and fresh water are ‘gold’ on board, so we had to keep consumption of both to a minimum. Bruno had a six liter garden sprayer to rinse the salt water off us in lieu of a shower. 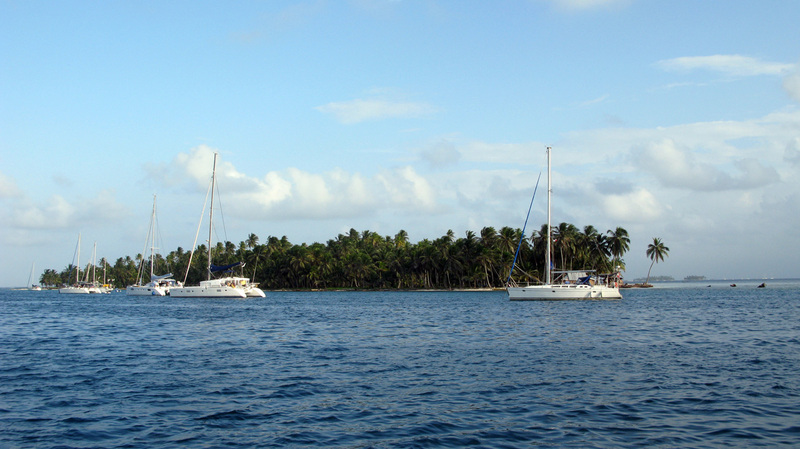 Coming into our first harbor at Coco Bandero. White sand was just a quick swim away. The scene from on deck looking aft. And the scene below deck. Everyone's bedroom, living room, kitchen, bathroom and office. Our bed is behind on the left by the maps. Our bed. Right up in there with all the extra tanks of diesel. Mmm that's good sleepin'! 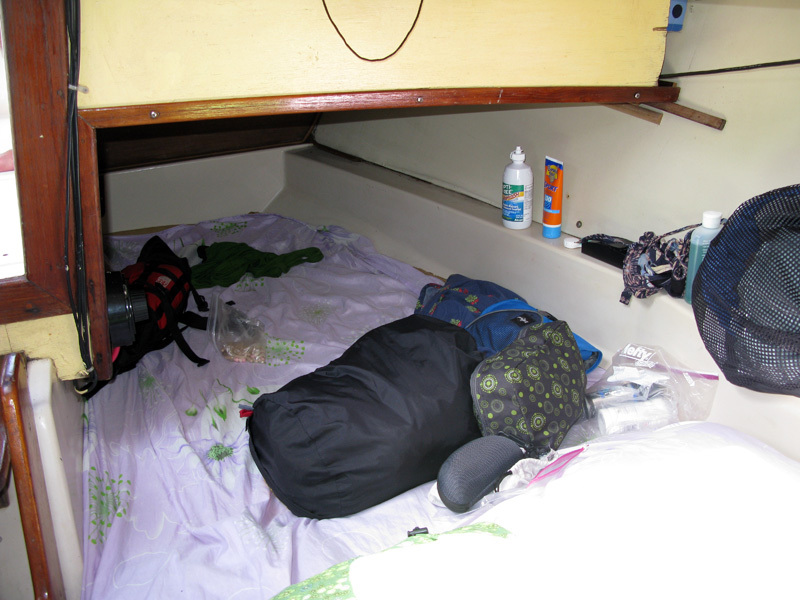 Caro couldn't take the fumes after the first night and opted for her Thermarest above deck. Bruno directs us into harbor as I captain the Winfli on day 2. Swam out to our own little island. Photo by Marcos. 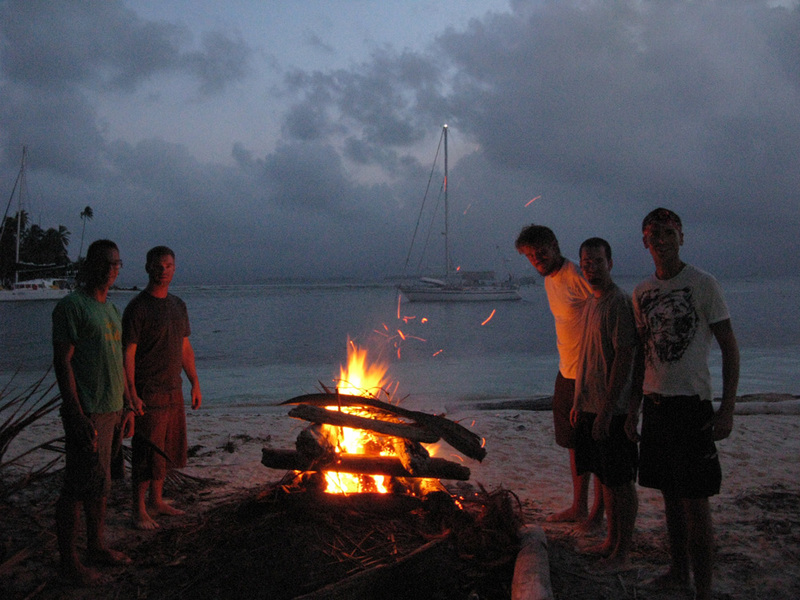 We built a nice bonfire with the driftwood and coconut husks on our little piece of paradise. Winfli in the background. After our tasty dinners it was usually cards, but on this night beers too! We were able to secure libations from one of the islands. 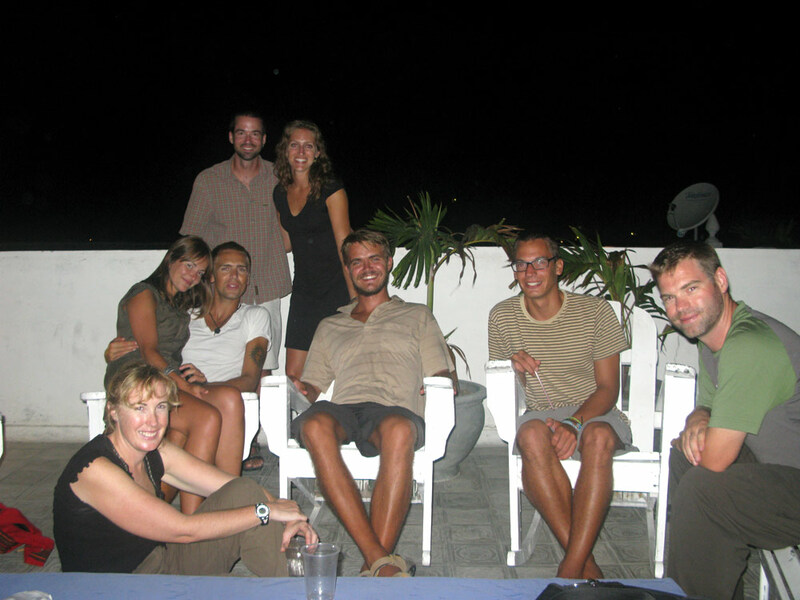 Jim, Pat, Caro, Craig, Marcos and Stefan. 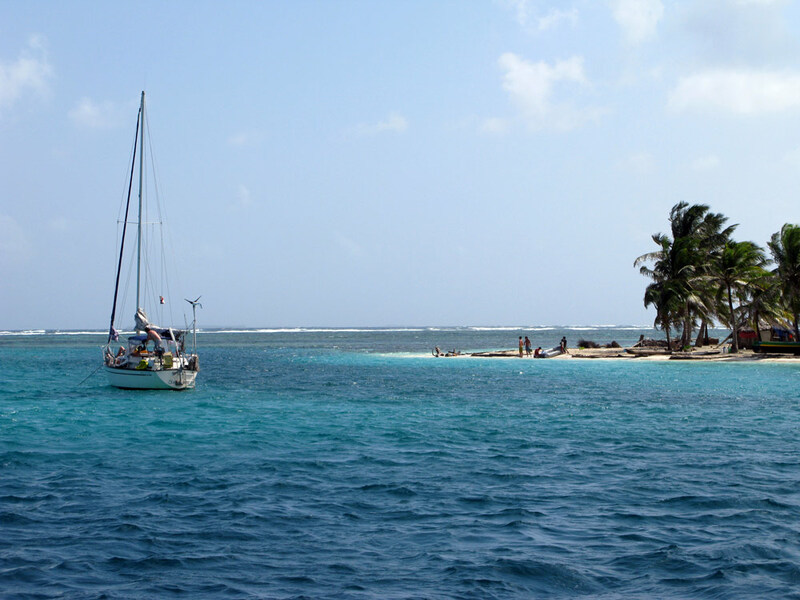 The 365 San Blas Islands stretch for miles along the Caribbean coast of Panama all the way to where the isthmus connects to the South American continent. 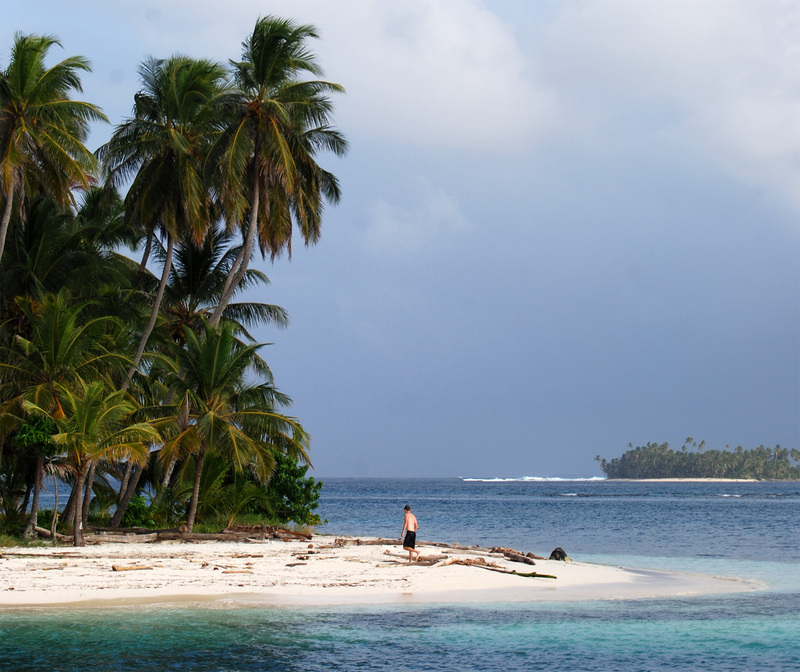 Covered in tall palms and coconuts, almost every island comes with its own white sandy beach around it. The Kuna people are the native inhabitants on about 50 islands and most still live a very traditional life with few modern influences. 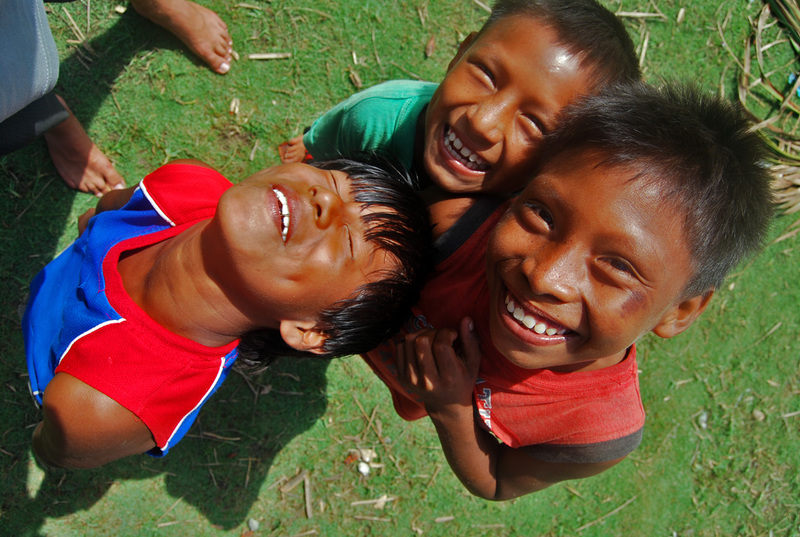 Panama barely governs the region so the Kuna are quite autonomous. Whenever we arrived off an inhabited island a few Kuna would canoe over to check us out. One evening they paddled out to deliver our order of fifty fresh bread rolls and a bunch of ice blocks! 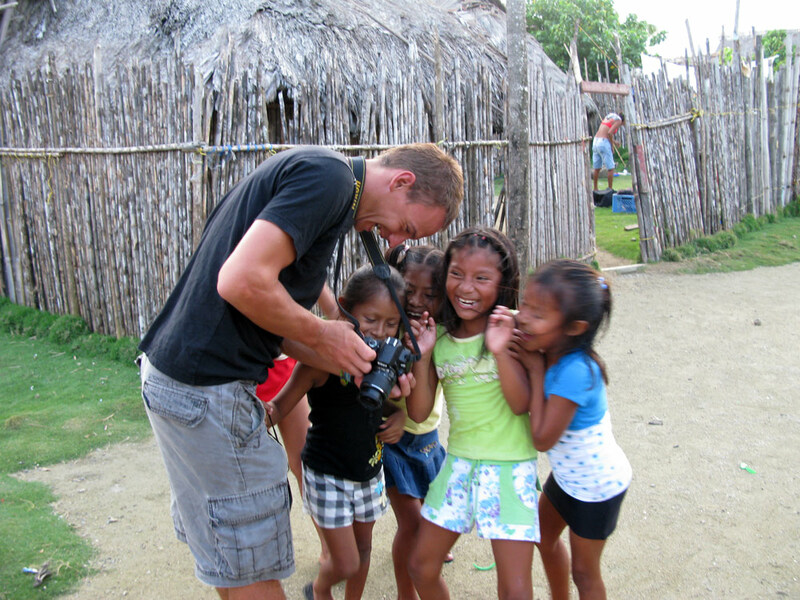 Stefan entertains the Kuna girls with their picture. The children were happy to have some visitors. Photo by Marcos. 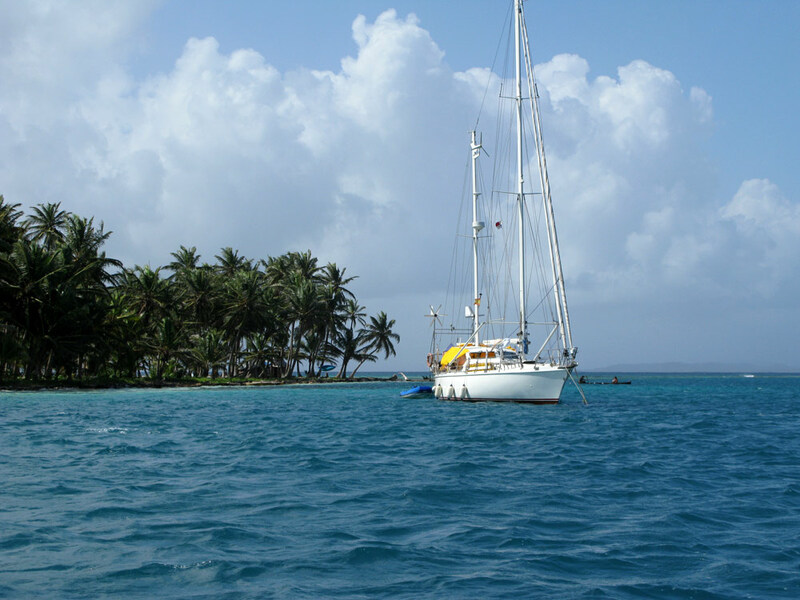 Our sailboat Winfli anchored at our last harbor in Panama. We finally made it to Colombia: (l-r) Marcos, Kirsty, Ingrid, Bruno, Caro, Pat, Caren, Stefan, and Jim. Our route still had a few days of pounding over rough semi-protected waters and we ended up anchoring for two days to let the rough seas calm down. 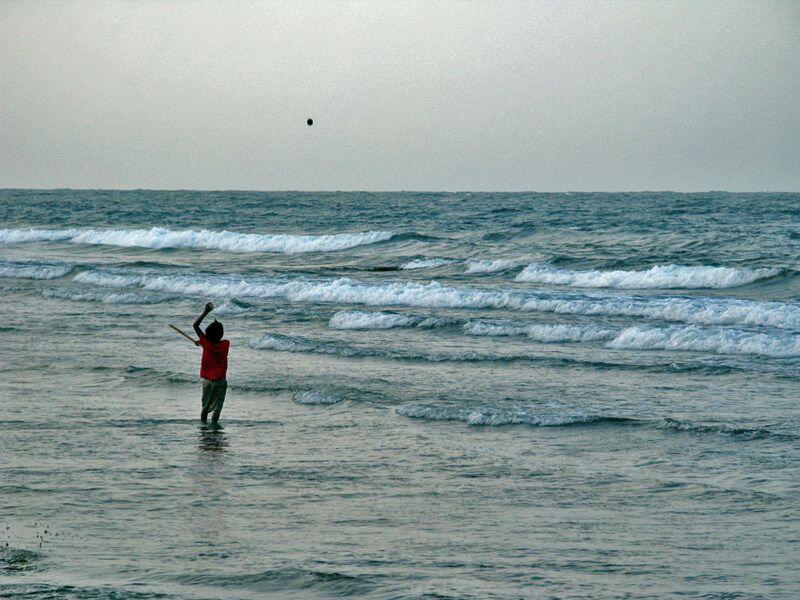 We decided after that about three hours was an ideal amount of time to be swaying and crashing through the sea. The two days we had eight-hour passages were a bit much, since with all those people on board you could do nothing but stare at the horizon to fight off nausea. So glad that we didn’t do the direct route, it would have been very rough. Our route, click for the full map. 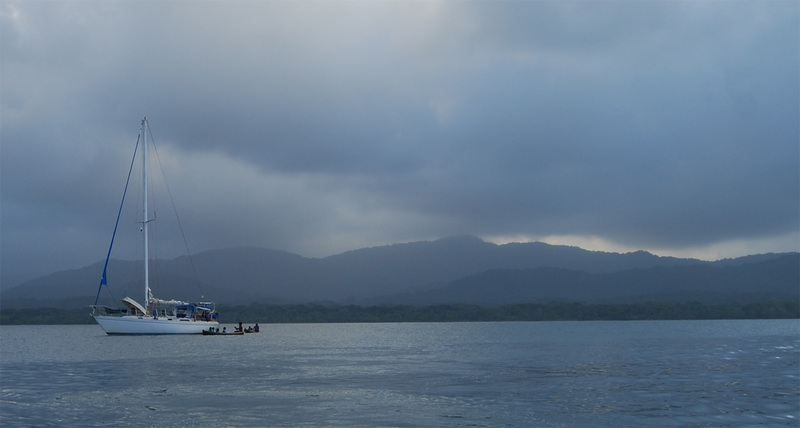 Our route followed the coast of Panama down past the Darien Gap until we reached the north-western border of Colombia at a town called Capurgana. We disembarked there and got our passports stamped into Colombia with ease. 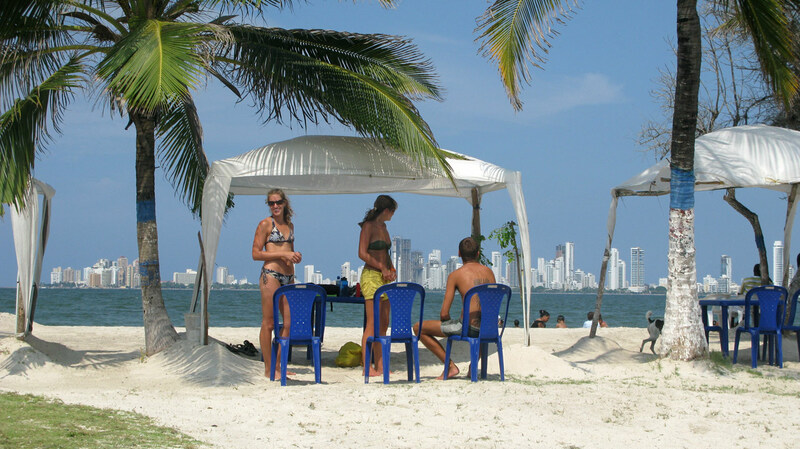 We spent the night there, then on the next day we had a wicked journey to get all the way up to Cartagena. I’ll describe it for you: three hours from Capurgana to Turbo on a 400 horsepower speed boat crashing through the waves. That was quite fun for a while. Once in seedy Turbo we got swarmed by touts until boarding a bus to Monteria, a four-hour journey over mostly dirt roads. Finally the last leg from Monteria to Cartagena is another four hours which we covered in a white knuckle minivan ride with either the best or worst driver in Colombia. I say that because we’ve never been more afraid as this driver overtook everyone on the road at break neck speeds, at night, while talking on his phone the entire time. But we did make it intact. We were so glad to finally be in beautiful Cartagena just four hours before my birthday. 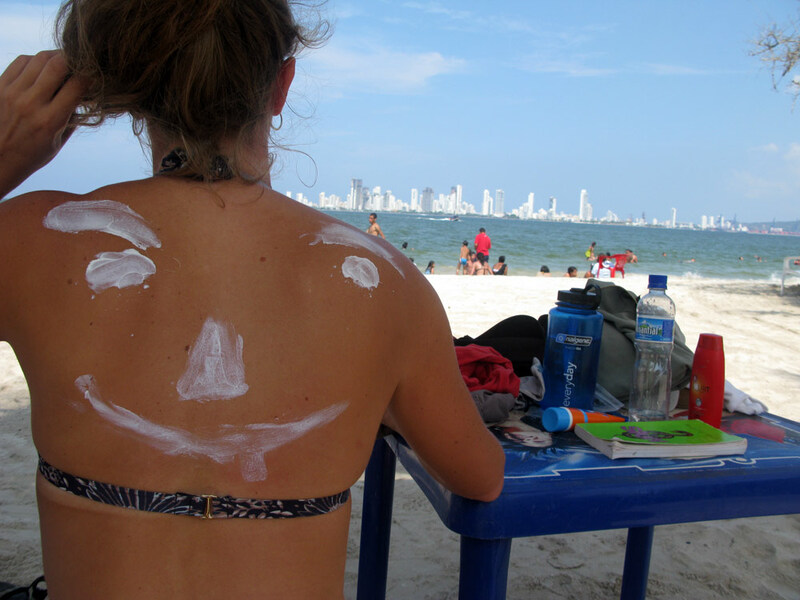 All told, it was eight days from Panama City to Cartagena on one taxi, one sailboat, three powerboats, one bus and a minivan. Was it a great time and an adventure? Absolutely, we had a blast and made some great friends. Would we do it again? 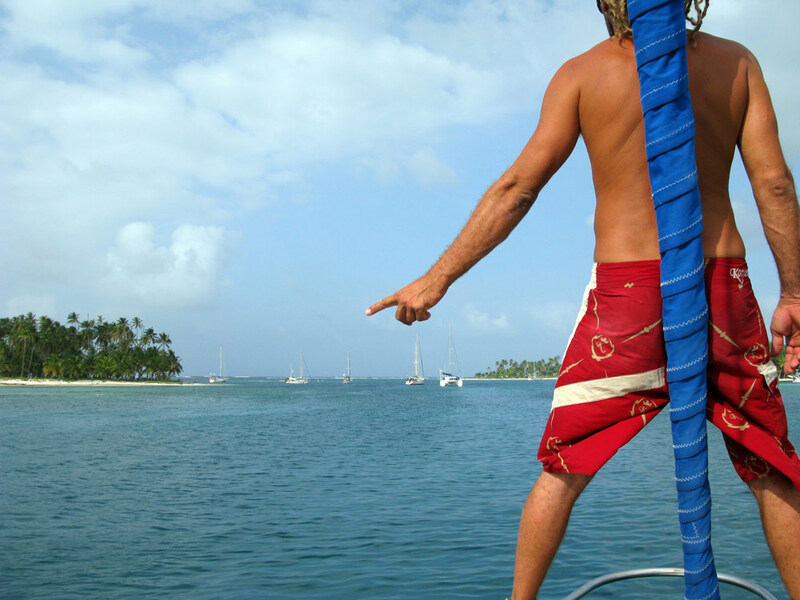 Probably not, best to spend a few days exploring the San Blas on the sailboat then fly to Cartagena. The next day however was perfect! 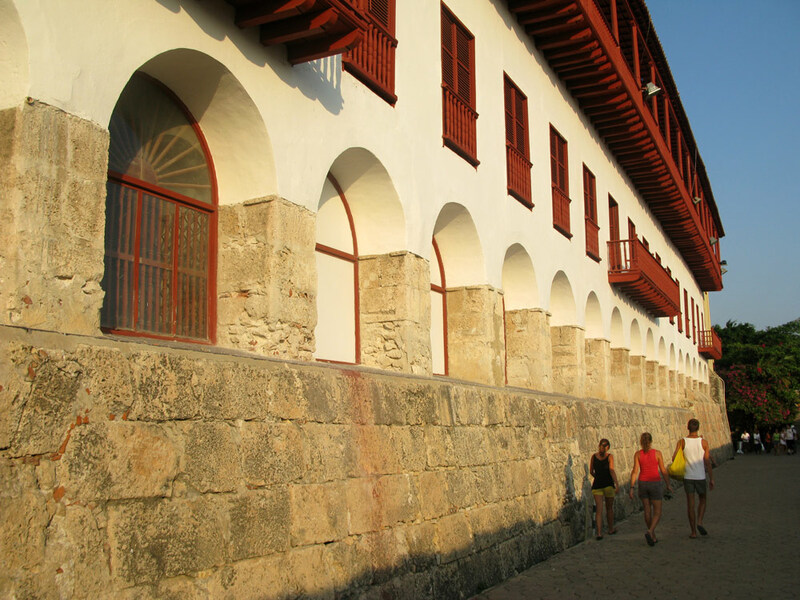 I got up early for a long run through Cartagena along the fortress walls of the old city and spent the rest of the day exploring this wonderful place with Caroline. So far we love Colombia! It’s beautiful, everyone has been awesome, there’s just so much to do and see. Definitely worth the trip, and luckily we’ve got sixty day visas! 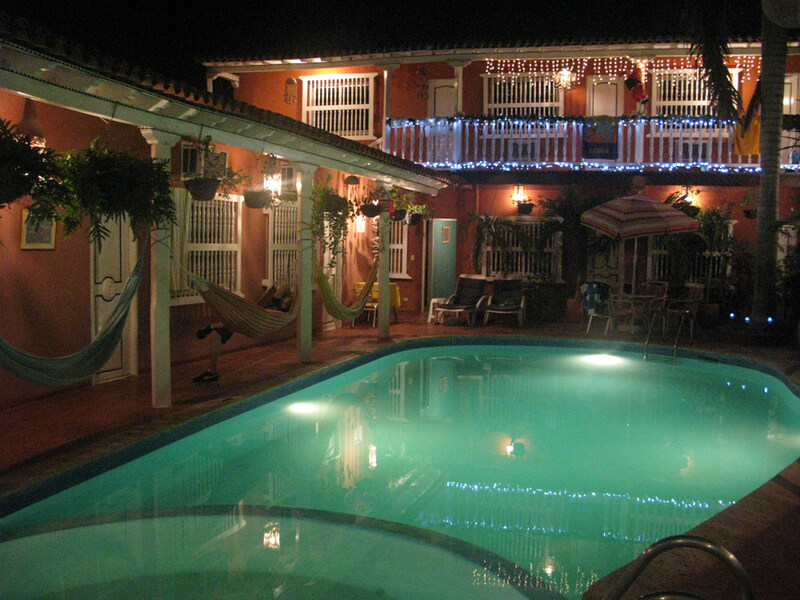 Casa Relax, our B&B in Cartagena Colombia where we spent my 29th birthday. Happy Birthday! 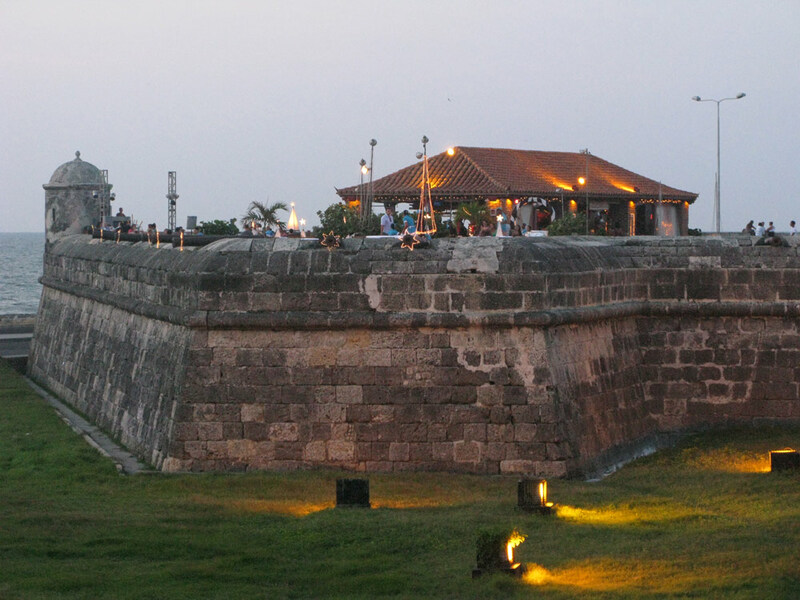 Drinks at this bar on the fortress wall of Cartagena's old city. 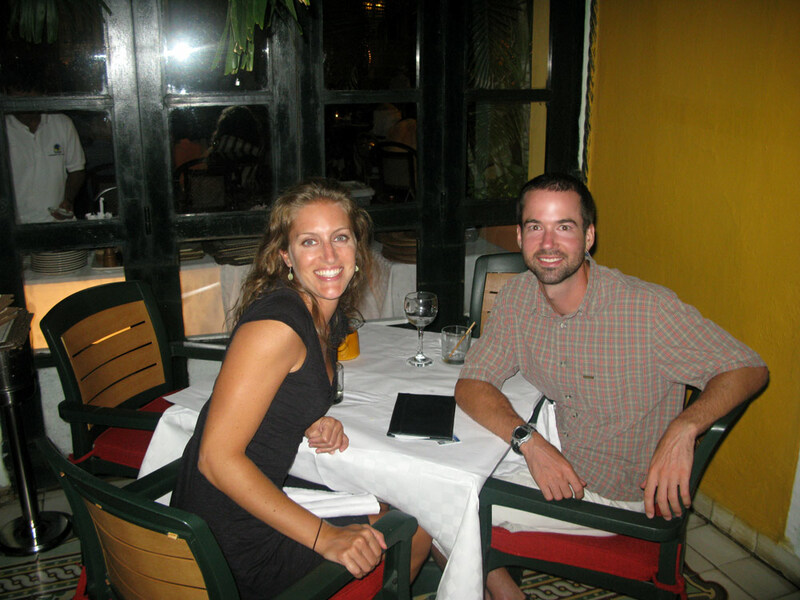 Followed by a fantastic dinner in one of the many restaurants around San Pedro plaza. Followed by more drinks with our boat crew on a rooftop deck overlooking the city, an incredible birthday! We had lots of laughs about the trip, all glad to be back on dry land. A couple days later we met back up with Kirsty and Jim for a day at the beach across from the city. Walking home through the old city. Good times in good places with good people. Dude, it looks pretty ruff down there, hope you guys can tough it out. Must really be missing work by now…hanging by the water cooler, listening to the latest on the Skins…making pointless small talk with pointless people…trouble shooting the copy machine… that’s living! 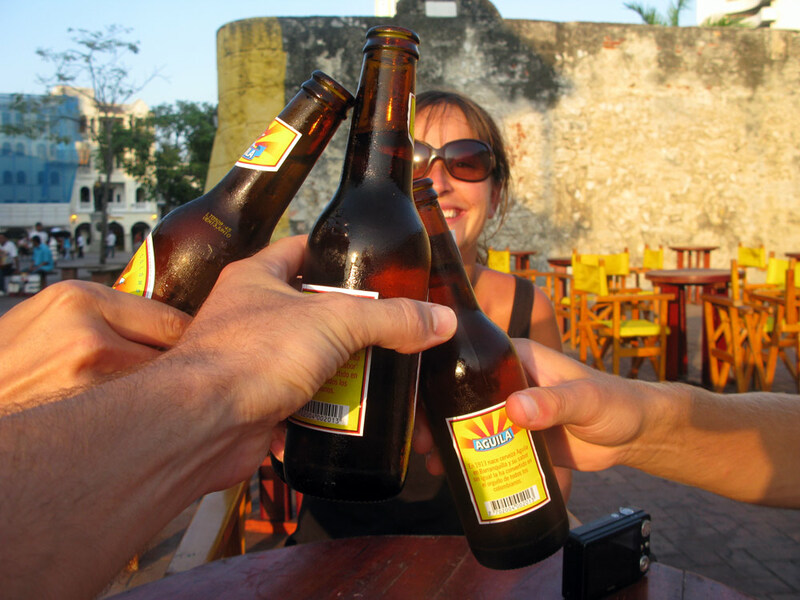 Seriously though, throw back a cerveza for Steve and I, or a Gentleman Jack if you can find it. Love the blog! Your Mom & Dad sent us your website address in the Xmas card this year and what fun it is to read about your adventures! Keep it coming and safe travels to you both. Happy New Year! I have enjoyed keeping in touch through your blog. Wonderful writing; great pictures. Be well. Be happy. Best to both of you. You had to refer to him as Captain Ron at least once right?!? Just got caught up on your adventures. Wow! You two keep it happening and continue the logs so one day we can follow. Ok, After the sailboat trip, I’m officially jealous. I was hanging in there for awhile, but now I just have to give in. 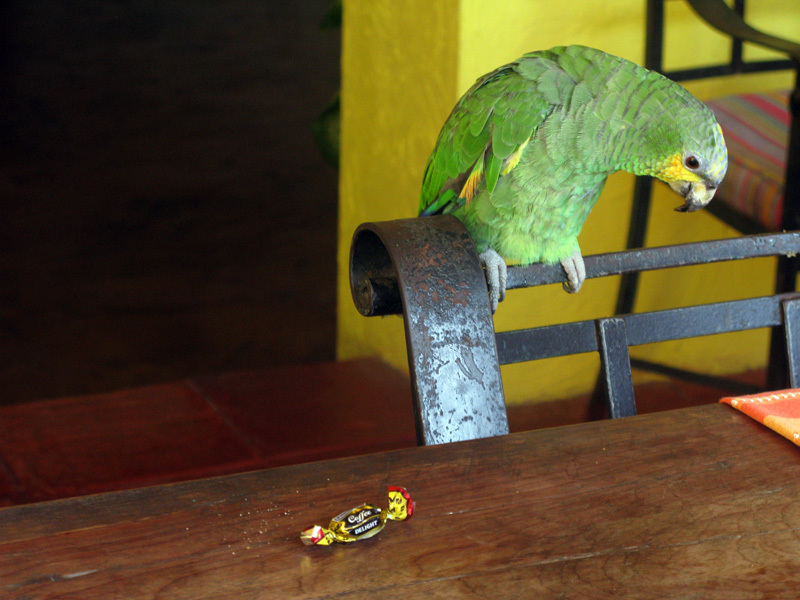 Cartagena…Romancing the Stone!